Does not cross- react with GluR2. The clone number has been updated from S355-1 to N355/1, both clone numbers name the same antibody clone. Our Abpromise guarantee covers the use of ab174785 in the following tested applications. WB 1/1000. Predicted molecular weight: 102 kDa. 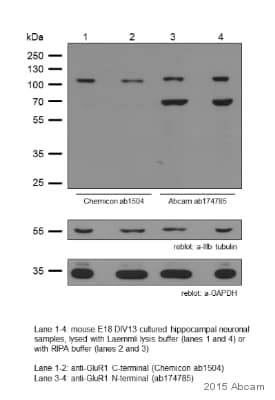 ab174785 detects Glutamate Receptor 1 (AMPA subtype) in 20μg of Mouse brain membrane lysate using goat anti-mouse HRP conjugayed antibody as the secondary antibody. Ionotropic glutamate receptor. L-glutamate acts as an excitatory neurotransmitter at many synapses in the central nervous system. Binding of the excitatory neurotransmitter L-glutamate induces a conformation change, leading to the opening of the cation channel, and thereby converts the chemical signal to an electrical impulse. The receptor then desensitizes rapidly and enters a transient inactive state, characterized by the presence of bound agonist. Belongs to the glutamate-gated ion channel (TC 1.A.10.1) family. GRIA1 subfamily. Palmitoylated. Depalmitoylated upon glutamate stimulation. Cys-603 palmitoylation leads to Golgi retention and decreased cell surface expression. In contrast, Cys-829 palmitoylation does not affect cell surface expression but regulates stimulation-dependent endocytosis. Cell membrane. Endoplasmic reticulum membrane. Cell junction > synapse > postsynaptic cell membrane. Interaction with CACNG2 promotes cell surface expression. Immunocytochemistry/Immunofluorescence analysis using ab174785 at 1/100 in Neuroblastoma cell line (SK-N-BE). Fixation: 4% Formaldehyde for 15 min at RT. Primary Antibody incubation for 60 min at RT. Secondary Antibody: Goat Anti-Mouse ATTO 488 at 1/100 for 60 min at RT. Counterstain: Phalloidin Texas Red F-Actin stain 1/1000 for 60 min at RT; DAPI (blue) nuclear stain at 1/5000 for 5min RT. Magnification: 60X. (A) DAPI (blue) nuclear stain. (B) Phalloidin Texas Red F-Actin stain. (C) ab174785 (D) Composite. Publishing research using ab174785? Please let us know so that we can cite the reference in this datasheet.